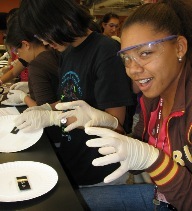 The MIT Women's Technology Program (WTP) is a rigorous four-week summer academic and residential experience where female high school students explore engineering through hands-on classes, labs, and team-based projects in the summer after 11th grade . Please explore our web site by clicking on the links to the left. The Application page has details about who should apply and how to apply. Calendar contains program dates and deadlines. Please check out our Frequently Asked Questions (FAQ) page before contacting us by phone or email. View this YouTube video to learn more about WTP! WTP is not a "summer camp" but an intense academic experience. Curriculum information is available on the WTP-EECS and WTP-ME sites--check these before applying to see if you have already covered our curriculum. WTP is designed for girls who have demonstrated their ability to excel at math and science in their high school classes, but who have no prior background (or very little) in engineering or computer science. We want to accept students for whom our curriculum will be a new experience. Since the WTP-EECS computer science class is an introductory class designed for students with no prior programming background, we do not accept students to that curriculum track who have already covered our CS curriculum. Check our FAQ CS question to determine if you have too much computer background for WTP-EECS. Students with CS experience who have an interest in learning Mechanical Engineering are encouraged to apply to the ME curriculum track. Female MIT graduate students design and teach the classes, assisted by female MIT undergraduate students who also live in the dorm with the high school girls. The daily required schedule includes classes, labs, homework, and social time with other WTP students. WTP classes do not earn academic credit from MIT; WTP students are expected to work hard because they are excited about learning. Sixty participants (40 for EECS and 20 for ME) are selected from a nationwide applicant pool of the top female 11th grade math and science students. We received over 700 applications last year. We are looking for students who are not yet certain about their future college majors, and who would like to explore engineering and computer science to determine whether these fields might be of interest. NOTE: WTP is not connected in any way to MIT undergraduate admissions. WTP has very different acceptance criteria than MIT. Acceptance or non-acceptance to WTP has no bearing whatsoever on a student's chances of future acceptance by MIT.